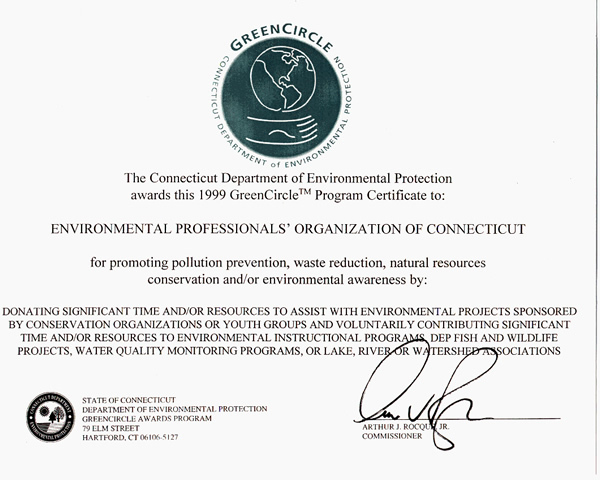 At a presentation on October 26, 1999, at the Sessions Woods Wildlife Management Area in Burlington, CTDEP Commissioner Rocque honored our association with his 1999 GreenCircle Award for environmental excellence in contributing to the quality of the environment in Connecticut. Accepting the award was Rodney Watts, Chairman of the Scholarship Fund (former), and Gary Cluen, Vice President (former) of EPOC. "Through significant contributions of time and resources, these volunteers have improved the quality of life in Connecticut. Connecticut is proud to have such dedicated groups and individuals in their midst," said Commissioner Rocque. Announced two years ago by Governor Rowland, the GreenCircle Program recognizes positive contributions promoting natural resource conservation and environmental awareness by businesses, institutions, schools, civic organizations and individuals. Fifty such groups were honored on Tuesday. The focus of that day’s presentation was to honor environmental conservation, education, outreach, and cleanups. EPOC would like to thank the individuals on the Scholarship Fund for their many hours of work and our sincere congratulations on receiving this award.